The fact that a piano tone sounds different depending on how the key is touched is not obvious to physicists. 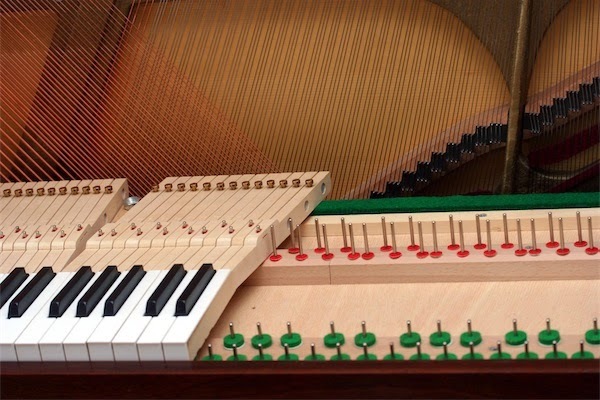 Many physicists and creators of self-playing pianos have argued that only one thing determines the tone intensity and timbre: the speed of the hammer hitting the piano string (here's an animated refresher on the inner workings of the grand piano). They claim that by exactly matching the hammer speed of each note of an artistic performance, an automated piano can create an identically-expressive performance. But pianists study for years to perfect a certain style of performance and control over the keys. For example, their fingers can either strike or press a key to change how percussive the note sounds. Surely, this style of touching the key can be heard above and beyond the simple speed of the key and hammer. The researchers on this new study lend support to the musicians. They find that a pianist's fingers and style can be heard, at least in individual notes played in a lab setting. The key is to factor in all the inevitable extra noises that come from playing the piano: the sound of fingertips and fingernails hitting the keys just before the note is played, the knock sounds from the hammer hitting the string and the key hitting the bottom of the key frame, and the thump of the key returning to its initial position after being played. All these mechanical noises add up to change the overall quality of the piano note, even if the volume of the extra sounds is tiny. Werner Goebl and Roberto Bresin, both musicians and authors on this study, played notes on a grand piano with a range of volumes, alternating between striking and pressing the keys. Using data from accelerometers attached to the piano keys and hammers, the team selected pairs of recorded tones with nearly identical hammer speeds. They played these tones to a group of musicians. The majority of the group could correctly identify a pressed key compared to a struck key, thanks to the nearly imperceptible sound of the finger on the key. 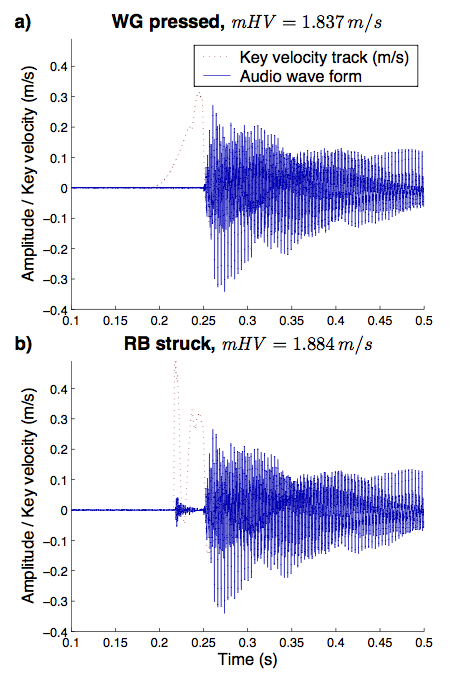 To get a sense of how quiet this extra finger noise is, these two plots show the waveform of a piano note being pressed and being struck with the same hammer velocity. The small sound of the finger hitting key is visible just before the struck sound in the bottom plot. It is a challenge to hear this sound apart from the note itself, but it makes enough of a difference to change the overall effect of the note. Wave form of the piano note when a key is pressed (top image) or struck (bottom image). Credit: Image courtesy of Goebl and Bresin. To investigate other piano noises, the team recorded identical notes with and without the key striking the bottom of the frame (like the note you listened to at the beginning of this post). Again they found that this small extra noise, hidden within the sound of the note itself, allowed listeners to distinguish between otherwise-identical notes. Goebl, lead author on the paper, says these two experiments prove that a piano sound is the result of more than just the hammer speed. "Pianists always knew that there is more, because they can feel the keyboard while playing" says Goebl. "However, physicists had a quite different point of view for almost a century now, which we have clearly rebutted with these two studies." Their research joins a small handful of other papers presenting direct evidence that touch can be heard within a piano sound. In other words, you can hear the human within the human performance. What I find most interesting in this study is the relationship between the tactile-experience and the sound produced in a piano performance. If an audience can discern the tactile sounds of a musician interacting with an instrument, then that musician might manipulate their performance to increase or decrease these tactile sounds and change the expression beyond just the volume of the notes. In fact musicians almost certainly already do this, and physicists are just playing catch up. In a related study on touch and sound, it seems that musicians often mix up their touch and sound senses when judging the quality of an instrument. When asked to rank three grand pianos by their sound quality, a group of pianists had no trouble indicating a preference. But blind listening tests showed that in fact the pianists could not hear the difference in the three pianos, despite their claims. Only when the pianists were allowed to touch the pianos (both with and without the ability to hear their music), could they rank the pianos with any discernment. The involuntary merging of two senses is known as synesthesia (smell and taste is a common link). It may be that a mild form of synesthesia between sound and touch is the key which makes live performances from talented musicians so universally compelling. Touch is not something so easily taught on the piano. Much like the use of the pedal it relies on the use of the ear. Touch can be learned best by demonstration and then what comes out depends on what the pianist is feeling from within. I do not feel that extraneous motions add to a persons touch. This is also why I much prefer that my beginning students learn on a real (acoustic) piano--even a poor-quality instrument if that's all they can afford--rather that on one of today's ubiquitous electronic keyboards. Touch never develops quite the same on the electronic device. The same thing happens with the organ. Touch developed on an acoustic piano can carry over into organ technique (I'm not sure how or why), but it has been my experience that someone who has learned to play on an organ first--especially a pipe organ--can produce a lifeless sort of tone on the piano. Now THIS is why I am forever against electric pianos. The piano has so much beauty, a machine cannot possibly replicate it. I'm not critical of people keen to play using electronic pianos - not everyone can or wants to be a concert pianist, Touch is a defining quality, particularly in relation to classical music playing. I see touch as a combination of rudimentary pianoforte technique coupled with an individual ability to convey to oneself and other listeners an interpretation of a piece of music which moves and inspires. Not everyone has that ability. I have always taught (and been taught) the need for a disciplined approach to developing touch such that it becomes the defining character of ones playing. You don't need to be note perfect if the sound you produce has a distinct technical quality, inner feeling and interpretive sense that grips both the player and listeners. I was never destined to reach the dizzy heights of the concert platform but to this day I treasure the discipline of touch developed over 30 years of learning and playing mostly classical music. It defines my playing and people notice my touch. I agree also with Evona York, regarding transition from piano to organ - it really shows in a persons performance whether they started on piano or organ (pipe or electronic). I've played pipe organs for over 20 years but always prefer to come back to base - my beloved piano. Keep up for the good work shcriminallaw! The information which you people are given are really superb piracetamdosage..!!! Hmmm. Well I can't tell the difference between the two notes and I've been playing piano for years. Perhaps it's just my style, a more intuitive way of playing, and if I were actually playing the two notes I would hear and notice the difference. But with me just listening to it, without any action, I don't hear a difference.